What a beautiful, sophisticated, mind-leveling thriller! SHUTTER ISLAND is not “scary,” but creepy, disturbing and filled with enough tension and intrigue to drown a plush toy. From a novel by Dennis Lehane, Martin Scorsese directs – or should that be “misdirects”? – brilliantly, never revealing enough information to give away the game, yet egging us on with just enough to tie us into a straightjacket. 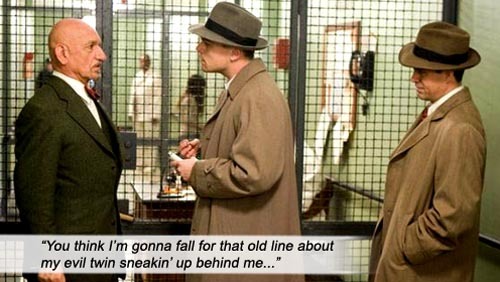 SHUTTER ISLAND is a Hitchcockian mind-bender that springs such a head trip in its last few minutes that you will watch it again immediately with completely new eyes. And you will see every clue hidden subtly in plain sight. Writers: Dennis Lehane, Laeta Kalogridis. Starring: Leonardo DiCaprio, Mark Ruffalo, Ben Kingsley, Max von Sydow, Michelle Williams, Ted Levine, Jackie Earle Haley, John Carroll Lynch, Emily Mortimer, Patricia Clarkson, Elias Koteas.